Mat Franco - Magic Reinvented Nightly takes to the stage at the LINQ Hotel & Casino for his first-ever Las Vegas headlining residency. The season 9 winner of "America's Got Talent" offers a fresh, fun and feel-good twist on magic that defies all expectations. In a full-scale production built on brand-new, never-before-seen material, the 27-year-old magician delivers his most spectacular performance yet - but still keeps his love of getting up close with the crowd at the heart of every show. With his signature brand of breezy humor, Mat mixes his amazingly inventive and always stunning magic with crowd-guided improv to create a once-in-a-lifetime adventure that's completely unique to each audience and entirely unforgettable. 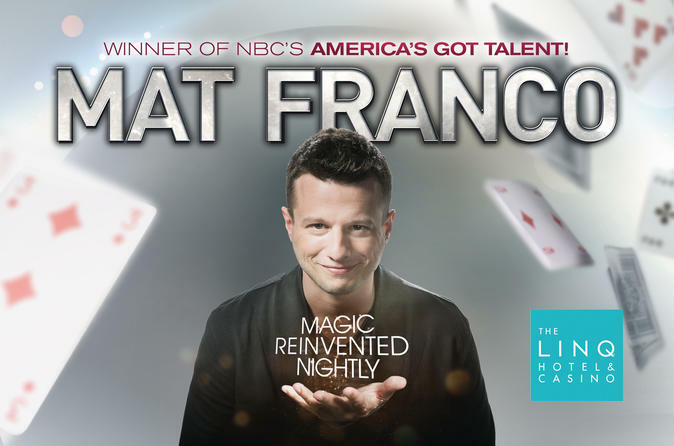 As the first and only magician ever to win NBC’s America’s Got Talent, Mat Franco takes an innovative approach to magic-making that’s driven by pure joy. Almost entirely self-taught, the Rhode Island native began developing his own shows before the age of ten.